How do you wait for someone who will never return? 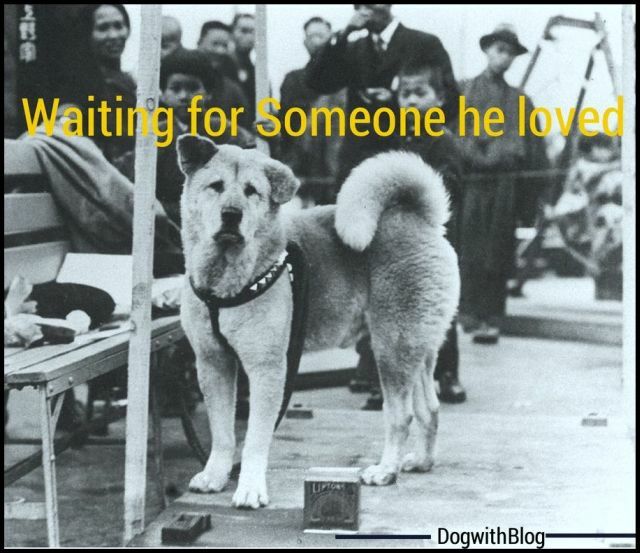 Hachiko waiting at the railway station for his dead master. ‘Loyalty’ to most of us, conjures up an image of the dog. Histories inked with their unflinching courage, companionship and love. Researchers would tell you that the smartest of us have a vocabulary of 300 words. But anyone who has ever loved a dog knows different. Although the chances are slim but if not for dogs, I hope you do find someone who loves you as much. I am a grammatically challenged canine and linguistics, I know little of. Emotions, however, comprise a language of their own. Centuries turned, worlds’ changed, humans evolved (for better or for worse) but dogs, we have forgotten to keep pace. Even at the face of death. From Hachiko to Ciccio, we have waited in earnest for that caressing pat on our mane which may never be. Grievance, you see, isn’t just a human trait. Here are four dogs (amongst countless others) that refused to believe in the phrase ‘Till Death Do Us Part’ and knowing their story you can’t help but wonder How do you wait for someone who will never return? 1. ‘Leão’ refuses to leave graveside of his owner. In January 2011, Brazilian capital was hit by a decimating flood. Amid thousands of causalities, there was a mixed breed dog (as humans refer to some of us) who refused to leave his owner Cristina Maria Cesario Santana’s grave. For days, Leao sat beside his owner’s grave in Teresopolis, near Rio de Janeiro, the area hardest hit by the flooding. He had to be taken away by the medics when his condition became critical. Thankfully, he got a new home. There have been reports that he ran away twice to the grave again. 2. Capitan: the Unflinching loyalty of the Argentine dog. Every single night since 2006, ‘Capitan’ has slept beside the headstone of his master’s grave. In Argentina, every single night since 2006, ‘Capitan’ has slept beside the headstone of his master’s grave. Miguel Guzman had brought ‘Capitan’ home in 2005. After Guzman died the next year, Capitan disappeared. A week after the funeral, the family returned to the cemetery in central Argentina and found Capitan there, howling. The heartbroken dog had found the cemetery and tomb on his own and has lived there ever since, sleeping on Guzman’s grave. In 2011, 35-year-old Navy SEAL Jon Tumilson — died in the helicopter crash that killed 38 American servicemen. There were 1,500 mourners in attendance at the local school gym paying their last respects, but all eyes were fixated on ‘Hawkeye’, who refused to leave the side of his dead friend’s casket. Till the very end: Hawkeye refused to leave his master’s side during an emotional funeral. Hawkeye now lives with Tumilson’s friend from Navy SEAL. Every day when a church in Italy rings the bells, Ciccio, a 12-year-old dog comes along hoping to reunite with his dead friend again. Ciccio and his owner lived in the village of San Donaci in the southern region of Puglia, Italy. When the bells tolled each afternoon, he would accompany the lady to the church. After Maria’s death, he attended the funeral and followed his mistress’ coffin as it was carried into the same local church. Thereafter, he just kept coming back, every day. His devotion has so impressed the parishioners that they rallied together to care for him, giving him water and food and allowing him to sleep in a covered area outside the church. The priest, while hoping to find a new home for the faithful dog, even lets Ciccio sit in front of the altar during service. There are many more Hachiko(s) out there; some with their tales guarded off from the media lights; silently waiting for someone who will never return. As you go to bed tonight, think for a minute of Capitan who would be on the gravestone in Argentina; Ciccio, with his hopeful eyes in Italy and as you hug your furry friend close, please try to make a difference the next day for those dozens of Hachiko walking around us. Just waiting for some love. Everything counts, even a friendly pat. Have you heard of more ‘legends’ like these? Let me know. PS: All images have been sourced from the internet and belong to their rightful owners. We keep searching for love in so many places but this is where it is… in the heart of your pet. Unconditional and forever, true and lasting. In all ways and means. You describe it perfectly. I hope your words..advise & those stories of Faithful Furry Companions Forever will echo in the hearts of humanity around the Globe! Giribala di’, Nainital also has an endearing tale. Sheru, a sheep dog who saved hostel stduents from a tiger…way back in 1950s. I hope these are tears of love and longing, my noamd friend. Sometimes as the tear traverses the landscape of face, drawing close to the lips, the heart heaves a sigh for our comrades for centuries, the canine. Memories enshrined in hearts go beyond the snapshots; in that shrine you shall always find your loyal friend. I just cant say how blessed I feel to have one that loves me in this selfish world!!!! I love this post. I actually got my wife a print of “Hawkeye”, from a TX artist named Stephany Chavez, for her birthday last summer. This was an amazing heart touching post. I also came across another such story on Discovery channel I am not too sure of the source though, but its a story about a dog named Spot in Texas despite her owner being dead in 2010, she still waits for him at the country side road everyday. Looking for him to come back from work and take her home. Dogs are truly amazing creatures, they love you unconditionally. I am glad that I have been blessed to have them as a part of my family. I will definitely check for ‘Spot’ on web. Touching to say the least! … I’ve adopted 2 stray dogs … Early last year when my dad was in the hospital for couple of days and I & my family were with my dad at the hospital, we requested our neighbours to feed the dogs … However, the dogs refused to eat for 3 days!! … Only when we returned home the 4th day, they had food & a sound sleep!! Only dogs can love like that, hope your dad is all hale and hearty now. Best wishes! Previous Previous post: How enlightened are you?